Along with Feenstra Architecture and Sharp & Diamond Landscape Architecture, Germaine Koh was part of the design team for the No. 2 Road North Drainage Pump Station in Richmond, BC. Integrating an artist into the design team created an opportunity to treat the entire building project as an expression of artistic intent. For this site, the fundamental intention was to conceive the entire site as a functional artwork. A number of features on site, colour-coded by function, reveal the various ways in which water is processed on site: pumped from storm sewers into the adjacent Fraser River, potable city water available from a drinking fountain and to service the site, and rainwater collected from the large wing-like roof that recalls the airplanes arriving and departing the nearby airport. Other colour-coded electrical and communications equipment supports these building functions. Germaine Koh, No. 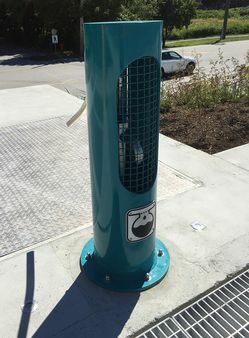 2 Road North Drainage Pump Station, 2018, utility building with interactive elements communicating pump station functions.